Inspired by the Honey Sweetened Cranberry Apple Sauce sample at last week's Union Square Farmers Market, I threw together this Cranberry Apple Relish with Fresh Thyme for lunch today and wanted to share. I was in the mood for something Thanksgiving themed but not heavy on the stomach. I was also a little put off by the butter and loads of sugar in the original recipe, so I set out to sweeten my cranberries with apple juice. Even with the natural sweetness of the apple, the effect was still a bit too tart, so I did end up adding in some honey and maple sugar. Sticking with the fresh thyme, the most appealing part of the dish for me, I added in a quick grind of ginger and the dish was done: tart, savory and sweet all at once. The result was a salsa-like consistency that act as a topping to multiple foods: I ate mine with butternut squash and chicken, but I imagine this salsa would go wonderfully with Thanksgiving day leftovers like turkey and mashed potatoes as well! It's kind of addicting, so don't hesitate to eat it by itself either. 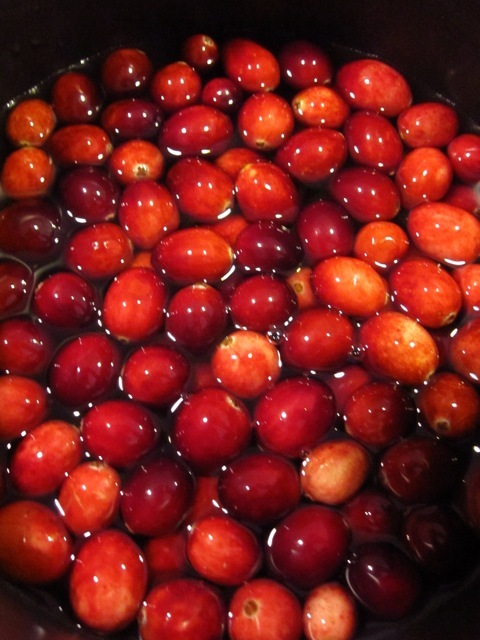 Bring cranberries, water and apple juice to boil in a medium sized sauce pan. Turn heat to low and cook cranberries, covered, for about 10 more minutes, or until you hear them pop. Drain excess liquid from pan and add the apple, thyme, ginger, honey and maple syrup. (I recommend starting conservatively on the sweeteners and adding to taste, depending on your tolerance for tartness.) Bring pot to a boil again, mix thoroughly, and serve. Cranberries are an antioxidant superstar with a short season, so stock up now! Their red pigments contain the bulk of these antioxidant phyto-nutrients, which are shown to combat flammatory diseases, urinary tract infections, and tooth cavities. (All that added sugar makes this last health benefit moot though, so try to keep conscious of your sweetener's quantity.) Check out Clean Plate's Ingredient Spotlight: Cranberries for some more info and recipe ideas on this season's favorite berry.